The twentieth century was the most destructive in human history, but from its vast landscapes of ruins was born a new architectural type: the cultural monument. In the wake of World War I, an international movement arose which aimed to protect architectural monuments in large numbers, and regardless of style, hoping not only to keep them safe from future conflicts, but also to make them worthy of protection from more quotidian forms of destruction. This movement was motivated by hopeful idealism as much as by a pragmatic belief in bureaucracy. An evolving group—including architects, intellectuals, art historians, archaeologists, curators, and lawyers—grew out of the new diplomacy of the League of Nations. During and after World War II, it became affiliated with the Allied Military Government, and was eventually absorbed by the UN as UNESCO. By the 1970s, this organization had begun granting World Heritage status to a global register of significant sites—from buildings to bridges, shrines to city centers, ruins to colossi. Examining key episodes in the history of this preservation effort—including projects for the Parthenon, for the Cathedral of St-Lô, the temples of Abu Simbel, and the Bamyian Buddahs —Lucia Allais demonstrates how the group deployed the notion of culture to shape architectural sites, and how architecture in turn shaped the very idea of global culture. More than the story of an emergent canon, Designs of Destruction emphasizes how the technical project of ensuring various buildings’ longevity jolted preservation into establishing a transnational set of codes, values, practices. Yet as entire nations’ monumental geographies became part of survival plans, Allais also shows, this paradoxically helped integrate technologies of destruction—from bombs to bulldozers—into cultural governance. Thus Designs of Destruction not only offers a fascinating narrative of cultural diplomacy, based on extensive archival findings; it also contributes an important new chapter in the intellectual history of modernity by showing the manifold ways architectural form is charged with concretizing abstract ideas and ideals, even in its destruction. Lucia Allais is associate professor of architecture at Princeton University, a member of the Aggregate Architectural Collaborative, and an editor of the journal Grey Room. 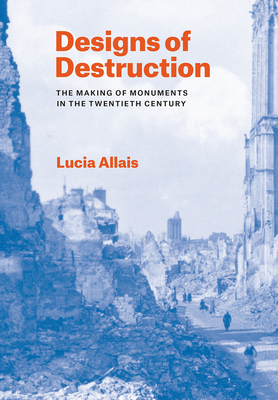 "Designs of Destruction is an account of the media and material cultures underlying the designation and construction of monuments from the early 20th century through the 1960s. Through deft analyses and nuanced interpretations of archival materials, Allais argues that monuments were 'made,' conjured as much from bureaucratic and diplomatic paperwork as they were built from stone, sand, and aggregate. . . . Call it what you like: architectural history of preservation; media history; institutional history of architectural preservation; or media history of international architectural governance. No matter the designation, this is a book for the ages."